Dance is a great way to express one’s style, inner feeling, and emotion. People born to have the desire to dance, and they all have the capacity of imitating body movement. However, few people dance in their spare time. • People have to drag the progress bar several times to learn each movement, it’s really inconvenient. After observing dance classes and interviewing dancing tutors, it is concluded that learning a dance after a tutor in front of the mirror is the best way of body movement imitation. Moreover, the learning process is made more efficient if one can communicate with the tutor during the learning period to have a comfortable learning rate. The iterative design process was done to get the outcome of Movba – a dance learning web/pad application for people interested in learning dances at anywhere. In Movba, People could watch and search the dance videos recorded by others. They then could learn, record, and share the dances. For the learning process, Movba uses the AR technology to solve the mirror image problem. People can see the virtual tutor as well as themselves from the screen, allowing them to make sure they are doing well. A dance is interpreted into motions and applied to a virtual cartoon model. The motions of the model can be slowed down or speeded up to meet users’ learning needs. Rather than reaching the device, users can “talk” to the “tutor” to easily control the learning rate. 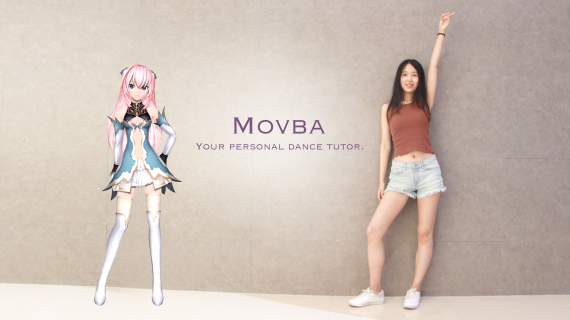 For the beginners, Movba presents several questions to understand certain users’ dancing experiences and preferences, in order to recommend the best videos for them. For returning user, Movba will recommend videos based on the initial questions and analysis of the user data. People’s patience is always limited. Therefore, in Movba, most dances are less than 1 minute, so that they can learn a dance very quickly and gain the sense of achievement. Movba gives people the opportunity to learn whatever dance they love, anywhere and at any time. It arouses the sleeping bodies, helps people to be more confident about their own bodies, and provides a new way to express themselves.